How do you get your dream home for the best price? When buying an overseas property, would you be confident of getting the best price? Buying a home abroad is harder than in your own neighbourhood. You’re out of your comfort zone, operating in a different language, currency and legal system, with little to compare prices to. Even worse, as a foreign buyer, many sellers will ramp up the price to take advantage. Yet the stakes could hardly be higher for one of the biggest purchases you will ever make. • Get the best property for your budget. 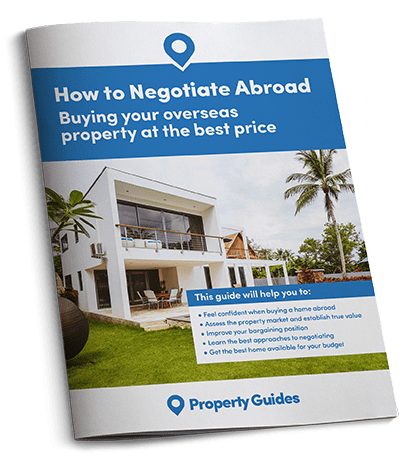 In clear and simple steps, it gives you a strategy for working with overseas estate agents to get a fair deal, and turn your overseas property dream to an affordable reality! We have a suite of free resources available to help you emigrate, including a team of expert professionals, who are skilled in the emigration process and can provide guidance throughout the different steps of the process. These include legal and financial advisors, reputable estate agents, currency specialists, and other expats, who are here to share their experiences emigrating and can provide detailed knowledge of how it all works. Once you have downloaded the guide, this expert team will also keep you updated with useful news, tips and articles on the different aspects of moving and living overseas, as well as shining a spotlight on some of the most popular countries to move to. The friendly and approachable team at the UK Resource Centre are on hand at the other end of the telephone to answer any questions about emigrating and are able to make recommendations and introductions to trusted advisors and experts who can help you at every stage of your move overseas. It can be reassuring to have a real person who is knowledgeable about what it takes to emigrate to talk to while you are making serious plans to move abroad permanently. Having searched the Internet, I found a Buying Guide website with the detailed, helpful guide and subscribed to the free newsletters offered. It was amazingly easy using the tips and suggestions to define my requirements and to establish my strategy for what I really wanted from my emigration. Once I had made use of the network of friendly and helpful associates I was introduced to, everything fell into place. It meant that I had a plan to keep me on track, so I was not tempted by any seemingly attractive but potentially risky alternatives.